Former Globe Artistic Director Dominic Dromgoole launches film production company OPEN PALM FILMS. The independent film production company has recently wrapped their first production MAKING NOISE QUIETLY and a slate of further theatrical productions will be announced early 2017, all of which are privately funded. 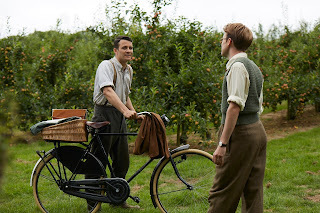 MAKING NOISE QUIETLY is an adaptation of the Robert Holman’s acclaimed stage play & is directed by Dominic Dromgoole. The film stars Deborah Findlay (THE LADY IN THE VAN, SUITE FRANCAISE), Barbara Marten (THE MILL, ORANGES AND SUNSHINE), Trystan Gravelle (MR SELFRIDGE, NATIONAL TREASURE & ANONYMOUS), Geoffrey Streafeild (A ROYAL NIGHT OUT, RUSH), Luke Thompson (IN THE CLUB & Christopher Nolan’s DUNKIRK) & Matthew Tennyson who reprises his role from the stage production, last performed at the Donmar in 2012 for which he won the Evening Standard’s most promising newcomer. The film is produced by NFTS graduates Alexandra Breede and Jacob Thomas. MAKING NOISE QUIETLY is a delicately poetic triptych of stories that paints a human picture of the subtly devastating effects of war and examines the bonds of suffering shared by us all. A conscientious objector and a roaming artist find tenderness as the carnage of the Second World War unfolds across the English Channel. A bereaved mother struggles with bitterness and love in recollecting her estranged son, lost in the Falklands. Deep in the Black Forest of Germany, an ageing holocaust survivor seeks to bring peace to disturbed young boy and his equally wild step-father. Open Palm Films was established in July 2016 by celebrated theatre director and writer Dominic Dromgoole. Its mission is to produce quality films, reflecting our tradition of direct, raw and honest storytelling, touching on themes that resonate in our present moment. Working with an amazing wealth of international acting and writing talent, Open Palm’s aim is to produce stories which resonate with audiences around the world. The boutique production company’s aim is to produce three features a year for which funding has already been secured for the first three years. Open Palm completed principle photography on its first feature, ‘Making Noise Quietly’, in September of this year. The film is an adaptation of Robert Holman’s play by the same name and was filmed on location in Germany, Kent and Yorkshire. Open Palm is scheduled to announce its forthcoming annual slate in January 2017. Dominic Dromgoole was the Artistic Director of the Globe Theatre in London from 2005 to 2016, directing numerous productions including a world tour of Hamlet (2014-16), which played in 197 countries, and the inaugural production in the Sam Wanamaker Playhouse, The Duchess of Malfi starring Gemma Arterton. Dominic also created a new play programme, a VOD platform for the Globe to Screen films and produced and edited The Complete Walk, 37 short films celebrating Shakespeare, ten of which he directed. These films played along the river Thames on 37 screens as part of the Shakespeare 400 celebrations in April 2016. Previous and future screening locations include: Rio de Janeiro, Dubai, Calcutta, Shanghai, Beijing, Santa Barbara, Gdansk, Madrid and Liverpool. Dominic is the author of The Full Room: An A-Z of Contemporary Playwriting (2001), Will and Me: How Shakespeare Took Over My Life (2006). His latest book Hamlet: Globe to Globe will be published in Spring 2017 by Canongate and Grove Atlantic.